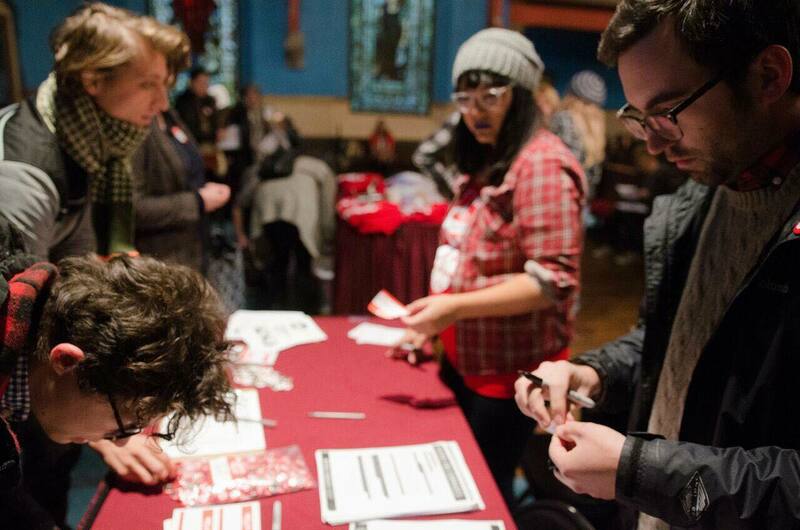 Image caption: organizers work a table at a Philly Socialists gathering. If you want to improve your living conditions and change the world, you have to reach out to people. Whether at a neighborhood festival, music concert or political event, setting up a literature table and talking to people can offer them an inspiring invitation to get involved in your work. Here are some tips from Philly Socialists’ chair David Thompson that can be used by any group! 1) To have conversations with people who you plan to engage in the near future. 2) To get those people’s phone numbers so you CAN engage them in the near future! 2) Sign-in sheets where you can get people’s name, email, and most importantly, their phone numbers. Fill in the top spot of your sign-in sheet with any name, number and email and then asterisk it [put * next to the info] so whoever enters the data knows it’s not a new contact. 3) Ideally, you should have a flyer for an event that’s coming up. Greet people with a smile and an active, rhetorical question, not one you’re actually trying to get answered. Go right into your “answer.” Give them the lit you’re holding in front of them as you’re talking, without looking at it or making a big deal out of it. This introduces what you’re representing, why they should care, gives them a clear action they can take, and opens up a conversation. It also lets them know you’re not looking for money. This makes people feel good. *You have to approach people. Most people will walk away. It’s okay! It’s a great way to get used to being rejected in other areas of your life. If someone looks totally uninterested, you’re probably right and shouldn’t waste your time on them! *People will vibe with whatever you’re putting out. If you’re tentative and unsure, they will be unsure and will probably walk away. If you think what you’re doing feels weird, so will they. But if you fake that it’s totally normal, it will put people at ease and they’ll be more open to talking to you. Once you get the person’s name, share yours and ask one more small talk question, like, “Where are you from?” Then tie their response into something about yourself, and, if it feels natural, tie that into something about the organization. By then you’ll see what, if anything, has grabbed the person’s attention. If nothing has, you can probably start wrapping up because they’re just not into it. You can ask, “Any of that sound interesting to you?” to be sure. Finally, tell them a bit more about what they show interest in, and/or say something like, “I can put you in touch with (so and so) to plug you into that.” Then move onto…. Then I show them to the sign-in sheet and have them sign up. *Phone numbers are best. Ask for it as they sign up if they don’t put it down. If they say, “Can I just do my email?” say “Sure! It’s just easier for us to stay in touch by texting,” which is true. If they don’t give us their number after that, that’s okay! But when they leave, write a fake number in and asterisk it for whoever enters the data to know it’s fake. Otherwise, every person who follows that person WILL NOT write their number down and everyone will hang their heads at the end of the day. *Look at what they write as they write it so you can make sure it’s legible. If it’s not, confirm with them what they wrote (“Is that a 4 or a 9?”) and write it below what they wrote. Otherwise, they may be waiting forever for a phone call that will never come. 1) Remember that this is a numbers game. Most people will walk away from you. Of those who don’t, only some will want to sign up with contact info. Of those, few will ever show up in person to a Philly Socialists event. That’s why we do this so much. But you never know, you could be talking to the future revolution’s pride. I like to imagine as much with nearly everyone I talk to. Don’t feel down if your conversion rate is low! Everyone’s is! If you stand out there and talk to people, you’ve done your part. 2) Do NOT lead with phrases like, “Are you interested in…” or “Would you like…” People are hardwired to say and think, “NO look away KEEP WALKING” when they hear any of those questions. 3) Do NOT ask, “Would you like a flyer?” Again, everyone will say “NO” as they run away. The material you have is a prop — it’s not important. Focus on giving lit out to people you connect with. A flyer in the hands of someone you haven’t connected with is going in the trash. A flyer in the hands of someone you have connected with is going to remind them of you and your connection. 4) Talking only to other tablers puts people off. It’s cool to take breaks and chat with your comrades. Just know that when you do that, you’re not talking to passersby, and you’re encouraging passersby to not stop and find out more. 5) Don’t sit behind the table and wait for people to come to you. Stand in front of the table with your material and approach people. 6) Seriously, if you’re at a table and sitting behind it, you are wasting your own time! 7) Have fun and enjoy the chance to get to meet new people who want to talk about socialism. There are plenty of them out there. Remember that you’re doing them a solid! You’re giving them a way to get active about their beliefs and do meaningful work. It’s good. You’re good. Thank you for being you.